Welcome to Otherworld, interdimensional home of the Captain Britain Corps! It's a magical realm of fairies, pixies and wizards - at least, ordinarily. Now, death and dismemberment are the order of the day - courtesy of an invading force led by a goat-headed sorcerer. Meanwhile, Fantomex stands accused of a crime so heinous the Corps has diverted its attention from Otherworld's defense to conduct his trial. It's up to X-Force to save him, but how can they leave Otherworld's peaceful citizens to fend for themselves against the invading army? 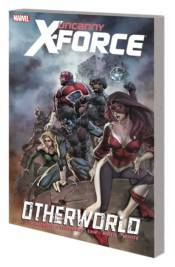 Now, X-Force is fighting for their lives on two fronts - to save the denizens of Otherworld and to prevent the Corps from executing Fantomex for the murder of an innocent child. And chances are good that not everyone will make it home alive! Collecting UNCANNY X-FORCE #19.1 and #20-24. X-FORCE: PHALANX COVENANT HARDCOVER DM VARIANT ED. X-FORCE: PHALANX COVENANT HARDCOVER DM VARIANT ED.